Aside from a clean bum, buying toilet paper may not seem like a choice that can make a great impact. But together our choices add up, ­and we can make a difference by using 100% recycled paper* bath tissue. If every household in the U.S. replaced one 24-pack of 240-sheet virgin fiber bathroom tissue with this product, we could help save over 4,900,00 trees**. Pretty remarkable, right? But just because you care about the environment, doesn’t mean the products you use have to work any less. 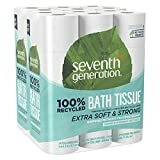 Seventh Generation 100% Recycled Paper* Bath Tissue is an extra strong and soft 2-ply toilet paper whitened without chlorine bleach. It’s gentle on the environment, septic-safe and RV-friendly, too. Be Sure to Clip Coupon for an Additional 30% Off! Price as low as $15.07 with 30% Coupon and 15% Subscribe and Save Discount!